Access control in Realejo district located on San Matías street. According to Access Control Municipal Regulatory Ordinance in Granada, there is an access control point in San Matías street to get to Realejo District. 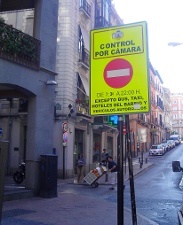 Also, to ease access to residents from the north of the city, people with resident card are authorized to pass through Elvira street camera control point until 22:00h, from that moment on residents can pass through Gran Vía street. At San Juan de la Cruz square. This control point is indicated before the beginning of the street (Ángel Ganivet street and Mariana Pineda square). To check a list of the restricted area streets in Realejo District you can check Municipal Ordinance. You must have installed any program that recognises PDF to see the previous file. Hotel customers in the restricted area are considered residents, and therefore, authorized to get through access control point. They must communicate their car´s number plate in the hotel´s reception, so the stablishment could send their reservation data to the Center for the Integrated Management of Mobility. Don´t forget to give your number plate to the hotel. If you are going to get to the hotel through Elvira or San Matías street, you can give your number plate once you are in the hotel. Ask your hotel recommended ways to get there and where to park. More info about hotels in restricted areas.